“Four workers were hired to carry weapons wrapped in sacks across the border and received by Thai men. Now they are on the run,” said Sith Los, deputy provincial police chief. 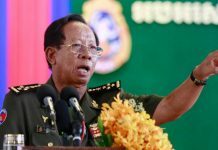 Authorities are seeking to question the four, who were allegedly hired by the three detained Cambodians to transport the arms across the border, Brigadier General Los said. 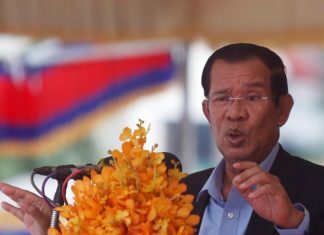 Op Vireak, 48, a Cambodian Mine Action Center employee, now suspended from his job; Chin Lin, 36; and Yim Savy, 38, were arrested on July 21 in Battambang province and sent to Banteay Meanchey province, where they were later charged for trafficking weapons and explosives. 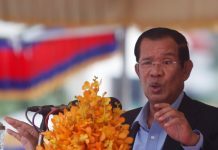 Sok Keo Bandith, Banteay Meanchey’s deputy prosecutor, said on Monday that the provincial court was investigating whether more people were involved. “The judge is still investigating the case,” Mr. Keo Bandith said, adding that the three suspects were being detained in the provincial prison pending trial. Mr. Vireak—whom the head of the demining organization, Heng Ratana, identified last week as Ap Lengcheu, a staffer since 1997—told authorities he had stockpiled arms found in an underground cache in 2008, Brig. Gen. Los said at the time. Six Thai nationals were arrested last month in Thailand, with five caught while allegedly transporting grenades, grenade launchers and ignition devices.